Those that faithfully serve me through praying the Holy Rosary will receive special graces. I promise special protection and the most remarkable thanks, to all those that pray the Holy Rosary. 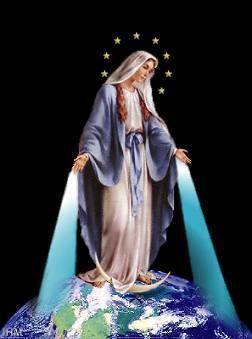 The Rosary will be the most powerful defense against the forces of the evil spirit. Vice will be destroyed; sin will be diminished; and all heresy will be defeated. Through the prayer of the Holy Rosary, the virtues will blossom, and the good acts. The souls will obtain plenty of mercies. The hearts will keep apart from the wordly affairs and its vanities; and souls will be elevated to wish the eternal goods. Let�s hope that the souls will make the purpose of becoming closer to God through this way. The soul that recommends to me through the prayer of the Holy Rosary, will never perish. The soul that prays the Rosary with devotion trying hard to meditate the Holy Mysteries, will not be defeated by bad fortune. In His Holy judgement, God will not punish him. He will not suffer unexpected death. And if he is just, he will remain in the grace of God; and he will be worthy of eternal life. The soul that keeps a true Devotion to the Rosary, won�t die without the Sacraments of the Church. Those who pray the Holy Rosary faithfully, will have in life and death, the Light of God; and the plenitude of His grace. At the time of death, they will participate of the merits of the Holy in Paradise. I will relieve from Purgatory all those who have had the habit of praying the Holy Rosary. All those who remain as faithful sons of the Holy Rosary, will deserve a high grade of glory in Heaven. You will obtain all you ask me through the praying of the Holy Rosary. All those who propagate the Holy Rosary will receive my help in their needs. For all the devotees of the Holy Rosary, I have obtained from my Holy Son, the intercession of all the celestial Court, through their lives and at the time of death. All those who pray the Rosary are my children,and brothers of my unique son, Jesus Christ. The devotion to the Holy Rosary is a sign of predestination.